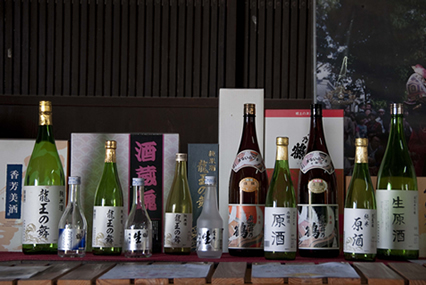 Within the history of the Himeji Domain, the local sake with close connects to the community and the flavor adored at dinner-time are being carefully preserved. You can feel the deep history of sake brewing at this sake brewery. Our ancestors were originally from Joushu(easteru Japan). They followed their lord to the Himeji Domain, in the changing of the country, during the Edo period. However, they did not immediately start brewing sake. 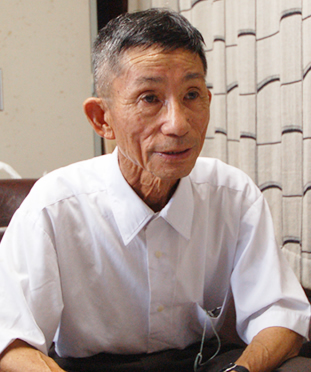 Their original livelihood, cultivation of Asian ginseng and producing medicine, was the result of Himeji Domain's response to the economic difficulties in the late Edo period. This land is known by the name "Saikojino Ginseng Administration Office Site (Okaniwa family)" and is a place that shares Himeji Domain's history with people. In the 4th year of the Meiji period (1871), a large peasant revolt occurred and, as a result, the ginseng administration office was destroyed by a fire. Afterwards, in the 8th year of the Meiji period (1875), they used the brewer's rice of the Harima region and were the first to begin brewing sake in this district. I have heard that one of the oldest warehouses, that we are still currently using, was built at that time. The family name "Okaniwa" was used for the brewery's signboard and it was known as "Okaniwa Sake Brewery" at that time. From that point on, the sake brewing business did well but, near the end of World War II, government mandated food rationing due to shortages forced them to close their doors. 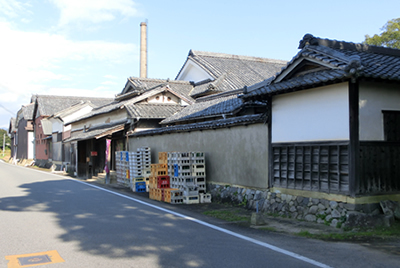 After the war, three warehouses in the same area restarted business as "Kanzaki Sake Brewery" and that is how we arrived at the point we are at presently. 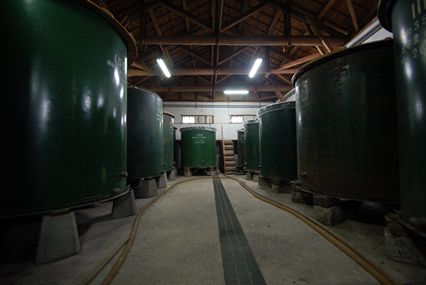 While being tossed around by the times, we have continued brewing local sake. "Manai No Tsuru" and "Ryuou No Mai" are both distinctive brands. The brewery's sake preservation room can make you feel the area's history. The sake that has absorbed the local area's thoughts is quietly sleeping here. 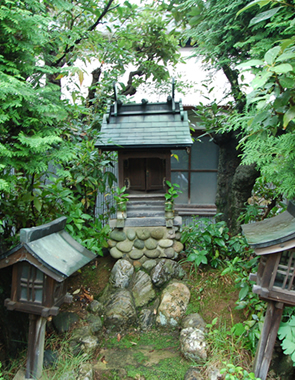 This is a small shrine on the premises. The shrine's god has been watching over the brewery since it started. We are a small brewery and so we are also focusing on our brand during production. "Manai no Tsuru", Manai means a fountain that erupts pure water, with the image of a celestial woman landing atop it, and has a clear and refreshing taste. Like a crane lands elegantly and mellow, that is how Manai no Tsuru tastes and is our image of it during production. We have been making this product for generations and it is a sake that you will never tire of and can enjoy each night at meal time. The other product, "Ryuou No Mai", is one that I began to produce during the beginning of the Heisei period (1989~). It is a sake that is connected to a dance offering, at a festival in the Harima region, that prays for an abundant harvest. It has a dry and invigorating taste, and it is my hope that people will drink this sake together while enjoying a wonderful time at festival dinner parties. Both of these sake go well with Japanese cuisine. Through sake that has deep roots in local culture, I hope that the local people's lives will become prosperous. You also have a product, "Gin no Bashamichi", that has a close connection to Harima's history. made with the traditional "boxed barley method,"
The road in front of our establishment is called "Gin no Bashamichi". During the beginning of the Meiji period, silver was transported by horse-drawn carriages on the 49km stretch of road from the Ikuno region in Asago city to the port of Himeji. It was the first industrial highway in the country. Currently, areas around the old route are cooperating and doing their best to promote it as a sightseeing route where you can travel around many places and get a feel for how it was back then. As a company, we were trying to think of something we could do to support this endeavor and the result is our product, called "Gin no Bashamichi". I hope that alongside local development, Harima sake will also expand. How about what you are going to focus on from here on out? What we are making is local Harima sake. The taste of "local sake" is what suits the local culture the best, so our product must be something that the local people love. I hope to put my heart into making delicious sake and have many local people drink it. Recently, I am happy to say that customers who come directly to the brewery to purchase sake have increased. From now on, I hope we continue to carefully produce sake within the range of our vision. Taste that does not get tired of mellow taste. It goes well with Japanese food, but the sake wide to be able to enjoy at the table every night. Taste with the sharp and elegant body and of the pure sake, is the one which you do not get tired to drink a little dry. Junmai for tourism planning highway of Japan's first supported the modernization of Japan in the "carriage road". ・A store dealing in our SAKE : Stores click here!